Now Or Never! magazine, in conjunction with digital rights activists The Electric Heretics, have issued a statement (see below) to the applicants running for the Norwich South New Labour candidacy that their party should be more careful with their personal data. The Candidate CVs of all four prospective participants; Norwich City councillor Victoria MacDonald; BBC journalist Clive Lewis; Joe Goldberg, who stood against David Cameron in Witney, Oxfordshire in 2010; and David Rowntree, drummer from Britpop group Blur; were found by a member of the public in an envelope left on top of a bin in Norwich city centre. Having lost to the Lib Dems at the last election, and their previous representative Charles Clarke moving on, New Labour have been deliberating over their future contender. Candidate CVs are personal documents detailing a nominee’s strategy plans as well as their private phone numbers, emails, addresses, referees and other highly sensitive information. This data could easily be exploited for fraudulent or blackmail purposes or misused by fanatics or stalkers if they fell into the wrong hands. Business Secretary Vince Cable has recently seen the consequences of ignoring Data Protection laws, with staff dumping unshredded confidential information in clear plastic bags outside his office. This carries a fine of up to £500,000 from the Information Commissioner’s Office if it concludes that security has been breached. With the Hacking Scandal still simmering away, in which politicians scolded journalists for plundering their private information, the issue as to whether they should be more careful about leaving it laying around casts them in an embarrassing light. Politicians must answer serious questions on Data Protection regulations, in politics and business, that are currently grossly neglected. Dave Rowntree, who has been parachuted in to add celebrity allure to the marginal proceedings, may regret the day he hammered out the song We’ve Got A File On You. Isn’t Data Protection a wonderful thing? The way it’s supposed to prevent important personal information from falling into the wrong hands, for instance. It’s rather ironic then, isn’t it, that New Labour were so appallingly lax during their time in office as to leave the digital backdoor open wide to identity thieves, fraudsters, vindictive ex-partners, family members, neighbours, work colleagues or anyone with a personal grudge and fanatics, as well as eagerly welcoming in private companies to data mine information on its own citizens. This was a crass invasion of privacy, totally at odds with European and International human rights, but New Labour and the unelected mandarins tucked away in Whitehall seemed to think that they knew better, and that these piffling rights didn’t apply. If any MPs had pangs of conscience about this, just set up the three line whip and thrash it out of their system! So it gives us great pleasure to announce that we have been provided with some misplaced CVs pertaining to all of the applicants standing for election as a Norwich South New Labour candidate. Whoops-a-daisy! Some butter-fingered intern’s going to get their plump, fresh, young knuckles rapped! We’re not going to disclose their identity though, as the point is not about apportioning the blame to some poor, inexperienced sacrificial lamb and sweeping the real issue under the carpet. No. This was not a leak, the information was left on top of a bin in the centre of Norwich and found by one of our curious associates who handed it to us. The real issue is, of course, the glaringly gaping holes in the Data Protection Act that allow this to so often and easily occur, and the various protocols and regulations that should be in place in government and in business, but are sadly not. In an article featured in The Metro newspaper on 14th August 2011, the Equality and Human Rights Commission stated that the way the government and its agencies use and store personal data is “deeply flawed”. Why did New Labour so carefully avoid addressing the increasingly important subject of Data Protection? This could be due to a number of reasons. One could be because most of your members do not realise the importance of protecting private information. So it may not have been deliberate, just ignorant. “If you’ve nothing to hide, you’ve nothing to fear,” right? We heard this mantra trotted out many times by New Labour drones to justify the introduction of the sickeningly invasive ID Card and Identity Register Database scheme. By that logic, would it be reasonable for us to, say, publish the email address and actual address of David Rowntree, drummer from popular beat combo Blur, who may have a lot of people who might like to contact him, or any of the other candidates' personal details in fact? I’m sure that in light of the Hacking Scandal, the concept of being slapdash with private information would be deemed a serious subject that needs addressing. Perhaps some other parties and members of the public may like to hear your suggestions for political campaigning? If you’ve nothing to hide, you’ve nothing to fear, right? The Lib Con Coalition hasn’t fared much better, screeching into a U-turn on its promises on curbing the Intercept Modernisation Programme and other pernicious data collecting exercises to spy on the population and keep them in check. Vince Cable was rightly lambasted for leaving important private details outside his office. 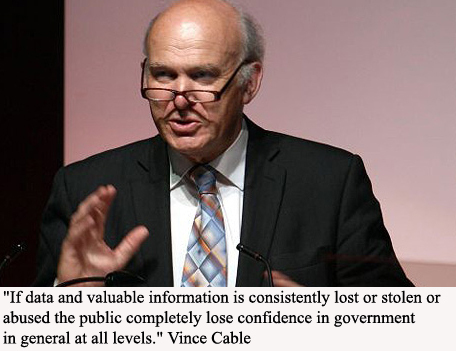 As Vince stated when in opposition, “If data and valuable information is consistently lost or stolen or abused the public completely lose confidence in government in general at all levels.” Shame he hasn’t done anything about it while in power too, as he might not have had to wipe all that egg off his face at the moment. 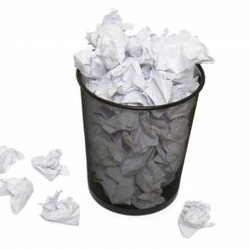 Last month Conservative Cabinet Office Minister Oliver Letwin apologised for dumping paperwork in park bins. Well, now it’s your turn, you lucky things. Another reason that New Labour may have forgotten to address the serious matter of Data Protection could have been due to hard cash. Gordon Brown admitted as such, saying that information from the ID card database would be sold to private companies to raise revenue. How terrible it would be to protect the rights of the individual, rather than be able to collect information on them and raise revenue, hey? A recent report from campaign group JUSTICE states that the RIPA legislation introduced by New Labour resulted in 3 million acts of surveillance, with fewer than 5,000 cases being approved of by a judge, and harrowingly more than 4,000 authorisations for intrusive surveillance, eg. planting bugs in someone’s house or car. Yes, New Labour did introduce the Human Rights Act. Well done. Actually enforcing it legitimately to protect individuals against the state, that’s a whole different story, and one you’d appear to rather ignore. Just like those illegal wars of aggression that you started and still haven’t finished while gross atrocities continue against civilians. Then there's the debt you got this country in more deeply than it needed to be. Those are perhaps a few of the reasons why less people voted for you in the last election, but which you all completely fail to address in your applications. You see, when it comes down to it, some private information should probably stay private. Getting your hands on personal information about people, that could be used for some pretty nefarious ends, couldn’t it? During New Labour’s time in office, you chose to ignore this very clear and present fact, and exploited it. Fortunately for you, and despite what newspapers and politicians may like to believe about Anarchists and human rights activists, The Electric Heretics and Now or Never! have social consciences. That is why we will dispose of the CVs in a safe and secure manner, unlike yourselves. We have, of course, contacted the press and Information Commission to let them know the blundering error that you have committed. Now or Never will be running a series of features on its website to highlight this issue, and if you’re very fortunate, you may even get a mention in the mag itself! To this end, we’d very much like to hear what you think on the subject of Data Protection, and what you will do to affect it if you were to be nominated and elected, so that your party members and prospective voters are aware of your position on this very serious matter. Nothing personal, you understand?